Sampling on the Kinabatangan River, Borneo - Croc alert! We are presently witnessing what has been described as the ‘sixth great extinction’. Several causes have been attributed to this phenomenon, including habitat loss and degradation, but the overriding cause for concern is anthropogenically induced global warming. If we are to understand and plan for the impact of ongoing and future climate change on biodiversity, it is imperative that we identify how past change impacted on earth’s biota. My research to date has focused on utilising inter- and intraspecific molecular variation to address these questions within the broad remit of conservation biology. I am also interested in addressing the following broad questions: How is genetic variability partitioned among taxa distributed across Archipelagos, and what mechanisms drive and maintain this variability? How prevalent are morphologically cryptic species that may obscure current estimates of species diversity and endemism? Do phylogeographic patterns of populations in widespread species mirror biogeographic patterns based on species distributions? Why are the tropics so diverse? Does ecosystem assembly on islands mirror that of continents? How common is extinction and colonization on oceanic islands? Does competition in ecologically-similar species drive diversification? 1. Investigating the role of palaeodrainage distributions on the evolutionary diversification of freshwater taxa. Taxa surveyed to date include freshwater shrimps (Caridina, Macrobrachium) and fishes (halfbeaks, killifish). 2. Meta-analyses and syntheses of geological, climatic, ecological and phylogenetic datasets to prioritise conservation planning. NERC Studentship - Alice Evans; with collaborators: Prof. Gary Carvalho and Dr. Si Creer, Bangor University; Prof. Siti Azizah Md. Nor, USM Malaysia; Prof. Tom Gilbert, University of Copenhagen. with Alice Evans and collaborators: Prof. Mahardika at Udayana University, Bali and Prof. Paul Barber, UCLA; funded by the Global Innovation Initiative. with Samantha Beck (MRes), Gary Carvalho and Ian McCarthy (Bangor University), Martin Taylor (UEA) and Natural Resources Wales, funded by KESS. Arctic charr, or Torgoch (red belly) in Welsh. Our work brings together data on developmental rate of fish larvae, population genetics, ocean circulation and the environment (specifically temperature) to generate predictions of recruitment that can be tested. This provides us with a powerful tool for tackling the uncertainty that characterizes the dynamics of wild populations in a rapidly changing world. Many fish populations, as all species living in nature, are exposed to a wide variety of changes in the environment that determine their abundance and distribution. Some changes are natural and include such things as alterations in food supply or number of mates, while others are largely driven by man-made activities, of which climate change and exploitation are two major types. Since fish form a major component of natural ecosystems in providing food for many other animals, and are predators of many groups, and since they also form a major source of human food globally, it is important that we estimate the role of various environmental changes on their dynamics, especially as many fish populations have recently collapsed, or are only in early stages of recovery. Here we examine, using several fish species from a well characterised region of the Antarctic, the potential effect that an increase in temperature might have on the numbers of fish entering the adult population ("recruitment"), and more specifically the rate at which their larvae develop. PI: Prof Gary Carvalho (Bangor University), with Dr Jen Rock (University of Otago, NZ), Dr Emma Young, Dr Mike Meredith, Dr Mark Belchier and Prof Eugene Murphy (British Antarctic Survey). While completing my Ph.D. research project, I wrote a research proposal (with Prof. Gary Carvalho) that sought to identify the causes of diversification in one of the world’s true biodiversity hotspots, the archipelagos of SE Asia. This proposal was funded under the European Union FP6 program: Marie Curie Incoming International Fellowships. With several large archipelagos situated between two continental shelves, South East Asia is the most geologically complex and yet understudied tropical region. Over the past 15+ years, investigations of genetic differentiation in widespread species have uncovered unexpected diversity and “cryptic” species in taxa that are morphologically similar, but few such studies have been conducted in South East Asia. I focused on 4 genera of freshwater fishes, two genera of freshwater shrimp, and several other taxa. The population genetic and phylogenetic data are providing good resolution to our understanding of how palaeo-drainages were connected in the past, and their role as drivers of diversification in this region. Several genera are restricted to freshwaters and bear live young, suggesting that biogeographical signal will be high, i.e. informative. By testing the paleo-drainage models with the molecular data from BIOASIA, this project provides the underpinnings for any future work on freshwater fauna and/or palaeodrainage models in the SE Asian region. For the shrimp and other genera, nodes within the phylogenies are deep and old, reflecting ancient vicariance across the Wallace Line as the Australian and Asian plates collided. More recent connections are evident within groups restricted to either side of this well-known biogeographic barrier. Ongoing bioclimatic modeling based on SE Asia’s historical and present climate will seek to identify the relative roles of ongoing processes (e.g. larval dispersal) versus those of historical processes (such as Pleistocene connectivity via palaeodrainage systems). Further publications are in preparation. de Bruyn M, et al. (2013) Paleo-drainage basin connectivity predicts evolutionary relationships across three Southeast Asian biodiversity hotspots. Systematic Biology, 62(3), 398-410.
de Bruyn M, Parenti LR & Carvalho GR. (2011) Successful extraction of DNA from archived ‘white-eye’ alcohol-fixed fish specimens using an ancient DNA protocol. Journal of Fish Biology, 78, 2074-2079.
de Bruyn M, Grail W, Carvalho GR (2010) Anonymous nuclear markers for halfbeak fishes of the genus Hemirhamphodon. Conservation Genetics Resources, 3, 155-157.
de Bruyn M, Grail W, Carvalho GR (2010) Anonymous nuclear markers for the Blue Panchax killifish (Aplocheilus panchax). Conservation Genetics Resources, 3, 53-55.
de Bruyn M, Grail W, Barlow A, Carvalho GR (2010) Anonymous nuclear markers for SE Asian halfbeaks (genus Dermogenys). Conservation Genetics Resources, 2, 325-327. Populations can respond to changing habitats by adapting (through natural selection or phenotypic plasticity), moving (to avoid habitat of reduced suitability, or take advantage of emerging habitat), by adjusting population size, or some combination of the above. Both natural selection and genetic drift can shape populations as they evolve in this context. 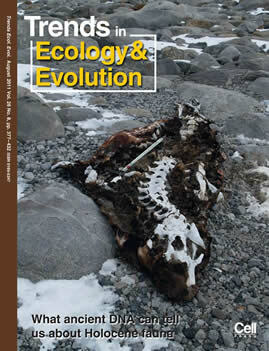 It is unusual for there to be an opportunity to track population dynamics and genetics during extended periods of environmental change, but an extinct population of elephant seals from the Victoria Land Coast (VLC) in the Ross Sea, Antarctica provided such an opportunity during this NSF funded project. I was employed as a postdoctoral research associate on this large collaborative project (glacial geologists – University of Maine & University of Pisa; isotopes - UC Santa Cruz; molecular genetics - University of Durham, Prof. Rus Hoelzel), and conducted all molecular analyses. We utilised radiocarbon-dating, and phylogenetic and population genetic analyses of ancient DNA retrieved from historical elephant seal remains recovered from exposed Antarctic beaches. We investigated the demographic and population genetic consequences of emerging breeding habitat suitable to this species in an environment rich in resources, and the impact of the eventual loss of that habitat. We tracked the founder-extinction dynamics of a population from inception to extinction in the context of Holocene climate change and found evidence that an unexpectedly diverse, differentiated breeding population was founded from a distant source population soon after habitat became available. de Bruyn M, Pinsky M, Hall B, Koch P, Baroni C, Hoelzel AR (2014) Rapid increase in southern elephant seal genetic diversity after a founder event. Proceedings of the Royal Society B, 281, 20133078.
de Bruyn M, Hall BL, Chauke LF, Baroni C, Koch PL & Hoelzel AR. (2009) Rapid response of a marine mammal species to Holocene climate and habitat change. PLoS Genetics, 5, e1000554. de Bruyn M, Hoelzel AR, Carvalho GR, Hofreiter M (2011) The neglected record of Holocene ancient DNA. Trends in Ecology and Evolution, 26, 405-413. For this project, supervised by Prof. Peter Mather at QUT, Brisbane, I employed neutral genetic markers (mitochondrial DNA and nuclear microsatellites) and a number of coalescent-based population genetic analytical tools to answer questions regarding the evolutionary history and causes of diversification in the economically important giant freshwater prawn (Macrobrachium rosenbergii). I collected samples (n = 1200) from island and mainland sites throughout the Indo-Australian Archipelago for this project. We identified two highly divergent lineages either side of Huxley’s Line, which have since been elevated to independent taxonomic status. Population structuring within each region either side of this biogeographic barrier was significantly influenced by past glaciations, which resulted in much lower sea-levels and reduced geographical distances among sites, thereby facilitating connectivity. Landscape and drainage-basin evolution played a major role in driving diversification in both shrimp and crayfish (an additional Ph.D. project I collaborated on) from the Indo-Australian Archipelago. de Bruyn M & Mather PB. (2007) Molecular signatures of Pleistocene sea-level changes that affected connectivity among freshwater shrimp in Indo-Australian waters. 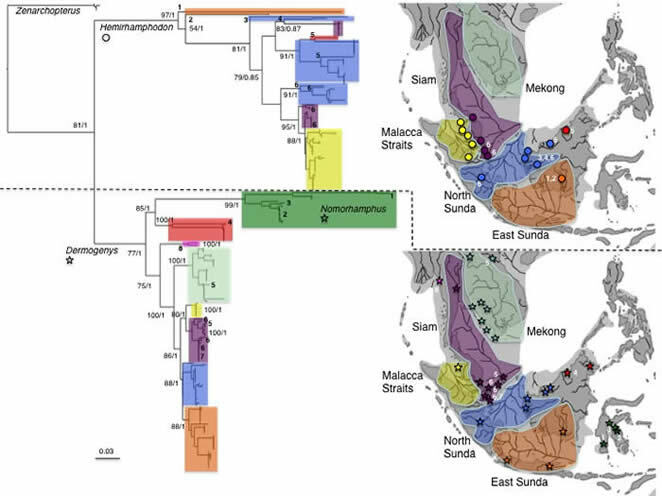 Molecular Ecology, 16, 4295-4307.
de Bruyn M, Nugroho E, Hossain MD, Wilson JC, Mather PB (2005) Phylogeographic evidence for the existence of an ancient biogeographic barrier: the Isthmus of Kra Seaway. Heredity, 94, 370-378.
de Bruyn M, Wilson JC, Mather PB (2004) Reconciling geography and genealogy: phylogeography of giant freshwater prawns from the Lake Carpentaria region. Molecular Ecology, 13, 3515-3526.
de Bruyn M, Wilson JC, Mather PB (2004) Huxley’s Line demarcates extensive genetic divergence between eastern and western forms of the giant freshwater prawn, Macrobrachium rosenbergii. Molecular Phylogenetics and Evolution, 30, 251-257. Jane Hosegood, Bangor University – Application of Novel Genetic Tools for Conservation and Management of Vulnerable Manta Rays. 2014 - ongoing. Co-Supervisor. Alice Evans, Bangor University – Assessing the impact of Freshwater Protected Areas through the use of environmental DNA. 2013 - ongoing. Principal Supervisor. Aimi Nurul Mat Jaafar, Bangor University – Phylogeography of Malaysian marine fishes. Completed 2014. Co-Supervisor. Samantha Beck, Bangor University – KESS Funded – Fish for the future: Population genetics of Welsh Arctic Charr. 2013-ongoing. Principal Supervisor. Jane O'Dwyer , Bangor University – Barn owl prey analysis: reconstructing habitat useage. 2013-ongoing. Co-Supervisor. Conor McCollum, Bangor University – Ancient DNA of Welsh Cave Bears. 2013 - ongoing. Co-Supervisor. Nicolas Welburn, Bangor University – Southern Ocean warming and marine connectivity – Completed 2011 (Ist). Co-Supervisor. Sarah Goertz, Bangor University – An evaluation of captive reintroductions - a stab in the dark or the road to success. 2013 – ongoing. Samuel Bernardes, Bangor University – Phylogeography of the freshwater shrimp Caridina typus. 2013– ongoing. Samatha Beck, Bangor University – Phylogeography of the blue panchax killifish (Aplocheilus panchax) – completed 2013 (Ist). David Wright, Bangor University – Evolution of SE Asian freshwater fishes – completed 2009 (Ist). PublishedRapid Response of a Marine Mammal Species to Holocene Climate and Habitat Change. 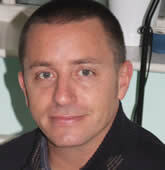 March 2011–April 2013 – Postdoctoral Research Officer – Prof. Gary Carvalho, MEFGL Lab, Bangor University. Impacts of Southern Ocean Warming on Marine Connectivity: Integrating Oceanographic Modelling with Molecular Ecology and Developmental Biology – NERC funded. November 2010–February 2011 – Postdoctoral Research Officer (temporary maternity cover position) – Prof. Gary Carvalho, MEFGL Lab, Bangor University. FishPopTrace: The Structure of Fish Populations and Traceability of Fish and Fish Products – European Community funded. June 2008–July 2010 – Marie Curie Incoming International Fellowship – MEFGL Lab, Bangor University. Multidisciplinary Approaches to Biodiversity Analysis: Testing Evolutionary Hypotheses in South-East Asian Freshwater Taxa – European Community funded. June 2006–May 2008 – Postdoctoral Research Associate – Prof. A. Rus Hoelzel, Molecular Ecology Lab, Durham University. Population Genetics of an Extinct Southern Elephant Seal Colony, Antarctica – ancient DNA – NSF funded.